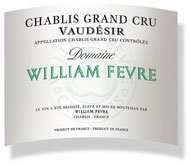 The Fevre 2007 Chablis Vaudesir exhibits a more adamant, chalky, oyster shell-like mineral cast than other crus in this collection, yet that goes hand in hand not only with a saline dimension, but with luscious, honey-tinged pineapple and peach, and a silken, faintly creamy textural tone. This finishes with an amazing indelibility of chalk and salt that’s like an incrustation. The big fruit and implacable mineral sides to this wine need some years to entirely come to terms with one another, but the whole will be bigger than the sum of both of them, and this wine should excite over at least the next decade. This is even more elegant than it usually is, which is saying something as there is a good argument to be made that the Fèvre Vaudésir is the current reference standard for the vineyard though I hasten to add that it's by no means an open and shut case. A pure and almost delicate nose that is decidedly more austere than virtually any of the preceding wines opens with a classic green fruit aromatic profile brimming with Chablis character that is followed by rich, full, naturally sweet and equally powerful flavors of simply incredible purity and focus as they finish with outstanding intensity, indeed this too is borderline painful as this early stage. This is a dramatic wine yet perfectly composed with a pronounced stony quality and the backend is bone dry. Succinctly put, this is a real stunner.